Bishoujo Senshi Sailor Moon Wallpaper: "Graphite and Sailor V"
Minitokyo »	Bishoujo Senshi Sailor Moon Wallpapers » Bishoujo Senshi Sailor Moon Wallpaper: "Graphite and Sailor V"
This wallpaper was created for Wallpaper Games-2: Match 08: "Graphite". The theme was to show a regular #2 pencil at work or just glorified in some way. And this was my interpretation. First I found this image: - Found on Oracle: Season 1 Screenshot section. Episode: 021; Page 2; Scan 3. 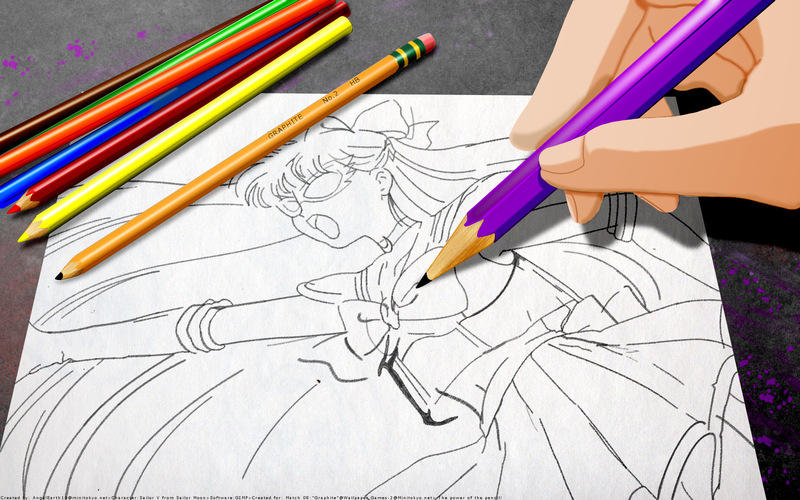 So, after finding the scan; I then separated the sketch of Sailor V from the hand. It took a bit of doing but I just waited till I felt I had found the right aspect. Then I scanned a piece of my own white drawing paper and sized and cut it accordingly to the image. Then came the Vector of Sailor V and the hand with pencil. As I worked on the vector of Sailor V... I knew a regular line wouldn't work. So, I went browsing and found someone showing how to make a sketch and found out they were using a brush. And a Gimp brush at that. More specifically: [url=]WFLU@DeviantArt's: Brush "GIMP animated crayon"[/url]. It is the best and coolest brush I've worked with yet. The texture of it and you can even use it in color. Great brush. So, I got Sailor V vectored out and as a whole the wall was empty. So, I started with an eraser in the upper left corner but it didn't look right. So, more hunting online ensued for 'colored pencils'. Found quite a few but this was the one that looked the best: ... The pencil's seemed natural to me and gave the paper and table top some direction and weight. --And along with another search. I found this regular pencil: ... I actually didn't mean to use in this wall. But one day I looked at what I had saved and it looked right to me. Now, vectoring the 'Colored Pencil's' and the 'Pencil' wasn't as easy as I had hoped but I kept working at it. And the Yellow is quite the temperamental color. Thus, through the vectoring I was working on and off with the back background. Its obvious the paper has to be on a desktop, table top, drawing desk, just something solid. So, my first instinct was to make whatever hard surface this was to be dirty. Make it something used for more then just sketching. And the end result came as a combination between a 'leather' type texture I found a long time ago and playing with Gimp's optics. I wasn't sold at first but after trying so many this was just the best. Then came the refining and defining stage for everything. The colored pencil's got the extra shading. While the pencil got extra shading and a text stamp. And the hand with pencil got an almost total do over but not quite. And the whole wall itself got a light defining make-over. I just has to trust my eyes, logic, and heart as to the lighting. Since, I am not the best at lighting. But I think I did a fair job of getting the lighting right on this wall. In the end this wall turned out better then I had first seen it as. I loved vectoring the sketch with WFLU's Crayon brush. It was just so cool. And I hope in the end you like it too. very nice work , good idéea !